Photopolymerization is a common process used for the solidification of materials in a variety of applications including dentistry, electronics, printing, optics and tissue engineering (2). This process, which allows for the fabrication of cell-laden hydrogels from aqueous precursors, offers advantages such as spatial and temporal control, fast curing rates at physiological conditions and minimal heat production (2). Photoinitiators are often used in bioprinting as part of the gelation process to solidify bioinks, but research has suggested that this crosslinking process may affect viability (1). This study tested effects of various steps in the polymerization process on cell viability with photoinitiators Irgacure and lithium phenyl-2,4,6-trimethylbenzoylphosphinate, also known as LAP or BioKey. While exposure to free radicals or Irgacure demonstrated decrease in viability, light exposure and exposure to LAP alone do not affect viability. When used with GelMA, the radical polymerization process does not affect viability with either photoinitiator. Various parts of the polymerization process, such as exposure to potentially harmful wavelengths, free radicals or photoinitiators themselves, can harm cells and affect viability (3). This study tests cell exposure to light, photoinitiators Irgacure and BioKey, free radicals created by these initiators and ultimately the entire radical polymerization process for the polymerization of BioGel. Cells cultured in 96 well plates were exposed to either 365 nm (LED ENGIN) or 405 nm (LED ENGIN) light at an intensity of 10 mW/cm² for 2 min, then compared to a control of no light exposure. 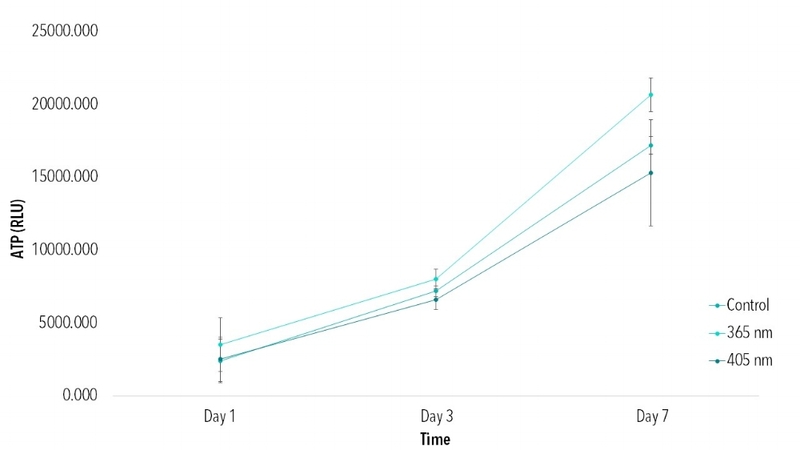 ATP data (Figure 1) indicates viability improves from Day 1 to Day 7 for all groups, with no statistical difference among groups at each timepoint. Figure 1: Cells exposed to 365 nm and 405 2D controls. ATP data indicates viability improves from Day 1 to Day 7 for all groups. No statistical difference found among groups at each time point (p<0.05). First, 0.5% (w/v) solution of LAP and 0.5% (w/v) solution Irgacure were dissolved in cell culture media under stirring and heat (65˚C). Then, cells cultured in 96 well plates with LAP or Irgacure were exposed to 405 nm light at an intensity of 10 mW/cm² for 2 min, then compared to controls of cells cultured with photoinitiators not exposed to light. Brightfield images taken of each group indicate altering cell morphology of cells cultured with Irgacure or those exposed to light with either LAP or Irgacure (Figure 2). Cells with no initiator and cells with LAP that had no light exposure demonstrated similar cell morphology to 2D control. ATP data demonstrates no statistical difference between cells exposed to LAP without light than cells without any photoinitiator. Groups with a photoinitiator exposed to blue light or Irgacure with no light had statistically lower ATP activity at each time point than controls (Figure 3). Figure 2: Brightfield images (10x) of cells at 24 hr after exposure to 0, 30 and 120 seconds of blue light with no initiator, LAP or Irgacure. Typical fibroblast morphology is apparent in groups with no initiator as well as cells exposed to BioKey(LAP) and 0 seconds of blue light. Abnormal morphology is apparent in other groups. Figure 3: ATP results over 72 h demonstrate no statistical difference among groups with no initiator as well as those exposed to BioKey (LAP) and 0 seconds of blue light. Groups exposed to Irgacure or a photoinitiator and Blue Light had statistically lower ATP activity. Groups with differing (*) indicate statistical differences (p<0.05). Figure 4: Cell seeding on BioGel (GelMA) crosslinked with BioKey (LAP) and Irgacure photoinitiators. Groups with differing (*) indicate statistical differences (p<0.05). Thin Films of 10% (w/v) GelMA were created with either 0.5% (w/v) LAP or Irgacure, respectively. After polymerization through exposure to 405 nm or 365 nm wavelengths, cells were seeded onto each thin film. No statistical difference was found in ATP activity among either of these groups and a 2D control on tissue culture polystyrene (TCPS) at days 1 and 3. At day 7, both cells seeded onto GelMA and LAPand cells seeded onto GelMA and Irgacure demonstrated higher ATP activity than a 2D control. Free radical polymerization is a popular process for cell encapsulation and 3D cell culture. Various parts of this process are potentially toxic to cells, including exposure to certain wavelengths, free radicals and photoinitiators themselves. This study tested various parts of this polymerization process in relation to photocrosslinking of GelMA. Exposure to 365 nm and 405 nm wavelengths for times needed to polymerize this biomaterial do not affect cell viability. When exposed to an activated photoinitator, cell viability decreased for both Irgacure and LAP. Without a monomer to react, activation of photoinitiators releases free radicals that are never terminated, leaving cells exposed to these particles for an extended time period. As expected, this exposure caused a decrease in cell viability, as evident through brightfield imaging and ATP activity. However when used in combination with a photocrosslinkable material such as LAP, cell viability is not affected, as demonstrated through ATP activity. Exposure to unactivated Irgacure also appears to affect viability, as cells exposed to this initiator with no light demonstrated lower ATP activity than 2D controls. Exposure to unactivated LAP did not affect viability, demonstrating that this photoinitator may be a better alternative to Irgacure when photocrosslinking cell-laden materials. This study demonstrated that the process of photopolymerization can create viable 3D cellular structures. 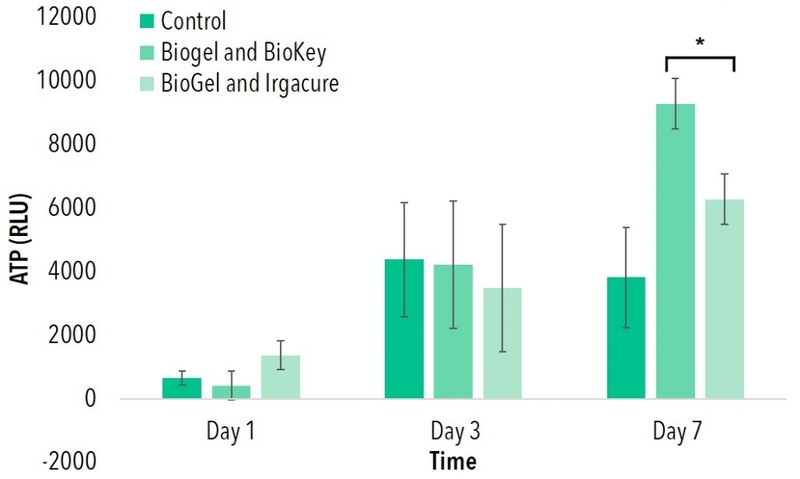 While both Irgacure and LAP, when combined with GelMA, produced hydrogels able to support viable cell populations, exposure to Irgacure decreased cell viability even without the activation of free radicals, suggesting that LAP may be a better alternative for the fabrication of photocrosslinked cell-laden hydrogels. To create thin films, glass coverslips were first treated as suggested in the protocol provided by Allevi. Then, 0.5% (w/v) solution of LAP and 0.5% (w/v) solution Irgacure were dissolved in cell culture media under stirring and heat (65˚C). Next GelMA, purchased from Allevi, was mixed at 10% (w/v) in each solution. After the mixture was completely dissolved and homogenous, it was sterile filtered (0.22 μm) (Millipore) as suggested in the protocol provided by Allevi. HNDFs were suspended at a concentration of 250,000 cells mL-1 and pipetted into the wells containing the GelMA thin films. Enough cell solution was used to submerge the samples. After overnight incubation, media was exchanged. To assess cell viability, CellTiter-Glo 3D ATP Assay (Promega) was performed according to manufacturer’s protocol and analyzed using a BioTek Synergy 2 Plate Reader. Nguyen, Kytai T. et al Photopolymerizable Hydrogels for Tissue Engineering Applications. Biomaterials 23 (2002). pp 4307-4314. Williams, Christopher G. Variable Cytocompatibility of Six Cell Lines with Photoinitiators Used for Polymerizing Hydrogels and Cell Encapsulation. Biomaterials 26 (2005) pp 1211 – 1218. J. K. e. a. Carrow, “Polymers for Bioprinting,” in Essentials of 3D Biofabrication and Translation, Elsevier Inc, January 2015, pp. 229-248. B. T. et al., “The 3D Printing of Gelatin Methacrylamide Cell-laden Tissue-engineered Constructs with High Cell Viability.,” Biomaterials, vol. 35, pp. 49-62, 2014.